On February 8, 2016, letters were sent to members of the Sierra Club in San Francisco from another Club member. That letter is available HERE: Letter to Sierra Club members. The letter contained a postcard petition on which members were invited to express their opinion of the Club’s support for deforestation and pesticide use in the San Francisco Bay Area. That petition is available HERE: Letter to Sierra Club members – postcard petition. 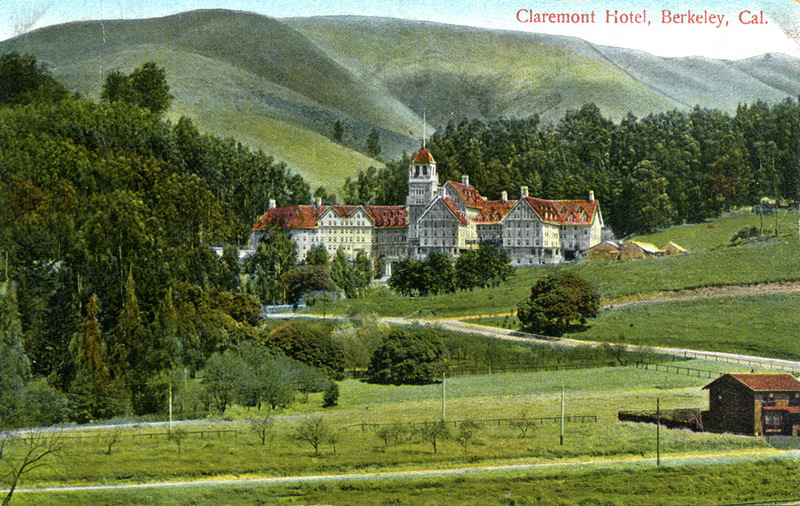 This antique postcard of the Claremont Hotel shows the treeless landscape of the East Bay Hills that the Sierra Club demands be recreated by destroying all non-native trees. The author of the letter intended to send her letter to all members of the San Francisco Bay Chapter of the Sierra Club. The Bay Chapter includes Alameda, Contra Costa, and Marin Counties, in addition to San Francisco City/County. Unfortunately, the staff of Sierra Club did not understand the composition of the Bay Chapter and therefore her letter was initially only sent to members in San Francisco. It took one month to correct that error. The letter was sent to over 20,000 Club members in Alameda, Contra Costa, and Marin Counties on March 8, 2016. We will report the response to the letter in April. Meanwhile, there is something Sierra Club members can do to influence the Club’s policies. The national Sierra Club is conducting its annual election of Board Members now. Ballots have been sent to all Club members with the roster of candidates. The roster of candidates and an electronic ballot are also available HERE. You must vote by April 27, 2016. If you are a Sierra Club member, we suggest that you look carefully at the qualifications and opinions of the candidates before making your choice. What is your opinion of pesticide use in public parks and open spaces? “Strong preference to zero use of pesticides. There have been occasions where serious threats from invasive species have proved practically impossible to overcome without targeted use of pesticides, but this should be a rare exception as opposed normal operating” procedure. “As you probably noticed from my candidate profile, I’m the ED of Pesticide Action Network, so I’m not in favor of pesticides–especially highly hazardous ones–in public spaces or anywhere else. I think the issue of non-native trees is specific to particular contexts and environments. But it’s unfortunate that the damage non-native plants and animals cause lead communities to demand increased use of pesticides and herbicides, which have negative consequences for human health as well as for the natural environment. As the presidential primary election rages on around us, we are reminded of how important it is to participate in our democracy. When we don’t participate, we are handing our power to those who do. Our country and our environment are in peril. Please step up and exercise your rights by voting in the election of the national Board of the Sierra Club if you are a member. I strenuously protest the Sierra Club’s participation, in partnership with the City of Oakland, EBRPD, and UC Berkeley, in the devastating tree eradication program on public land in the East Bay Hills. The Club’s position statements are unconvincing and at times misleading. You have even filed suit to permit ADDITIONAL areas of deforestation in the Oakland hills, over and above the 2,000 acres currently projected under the FEMA DEIS. Fire prevention is crucial, but your solutions (mass clear-cutting and extensive herbicide and pesticide use) are demonstrably counter-productive and ecologically destructive (all at huge taxpayer expense). There are other approaches, including selective thinning, as originally proposed by FEMA. Your salvo that low, scrub level “native plants” will somehow grow in to replace the long-established arboreal habit you are now tearing out is unacceptable. It will be non-native grasses (“weeds”) that will grow in the barren cleared land, as anyone who has ever cleared out any land knows (even us gardeners). Even the eucalyptus trees are integral to the habitat as erosion protection, windbreak, home to birds & other critters, not to mention the aesthetic factor of having an established forest rather than weed scrub. I was shocked to learn that you have refused requests from Chapter protest petition organizers, including Mary McAllister, to meet with you to discuss this project. Furthermore, you will not even print Mary’s letter in the Yodeler. After some 40 years as a life member, I regretfully can no longer support or contribute to the Sierra Club.